There are various ways to inject dependency in MVC. 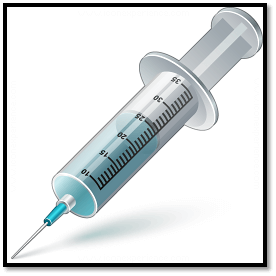 Dependency injection is a technique to pass the required Dependency so that the desired action can be performed. Dependency Injection (DI) is a pattern that shows how we can create loosely coupled classes. It means Class A is not directly dependent on class B and an object injects the dependency of another object. A dependency is an object that can be used as service, which is a part of this article. Earlier in .Net there were some well-known dependency resolvers like Unity, Autofac and Ninject and so on. .Net Core allows you to inject dependency out-of-the-box, there is no need to add the reference of the above mentioned dependency resolver. 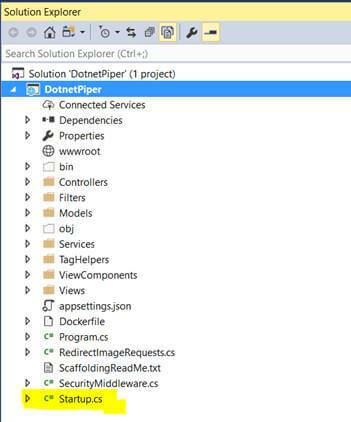 As soon as you create a solution you will be able to configure services easily, .Net Core manages this operation at its level that indeed helps a developer to get rid of this matter. 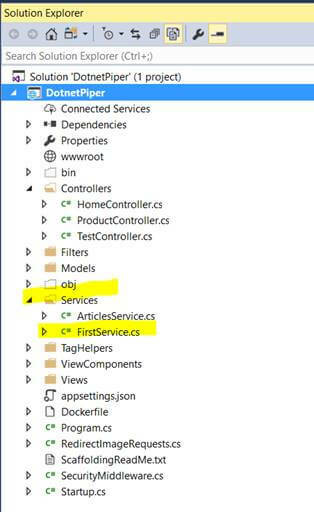 This article explains about how to configure custom service in .Net core and inject that service object in controller’s constructor as well as in action method. In the earlier versions of .Net it used to not inject the dependency at Action level. This is recently introduced with the release of .Net core. Action level injection of service makes an application lighter than controller level. 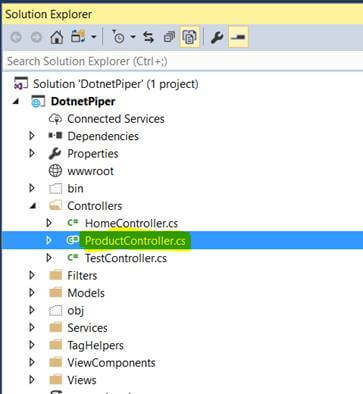 Consider a scenario when you have a number of action methods defined in a single controller and you have injected the service at controller’s constructor. Though it’s being used at one action only, it looks like it’s not worth it. In order to understand the dependency injection in .Net core 1.1, kindly refer to the given below image which states how the client application needs an object to access the implementation of given methods. FirstService class file has the following code snippet. There is a startup class file which exists in solution and has two methods ConfigureServices and configure. Refer to the below image to know more about startup class file location under solution structure. This method gets called by the runtime. Use this method to add services to the container. And it takes one IServiceCollection object as an input. Refer to the given below screenshot. To register your custom application services in ConfigureService method kindly put an interface definition object type that will be requested from the container. The second type represents the concrete type (class) thaFit will be instantiated by the container. [FromServices] attribute is newly introduced in .Net Core and brings an important role in order to inject abstract dependency at action method level. Press F5 and application will open in browser just to ensure that application is up and running. 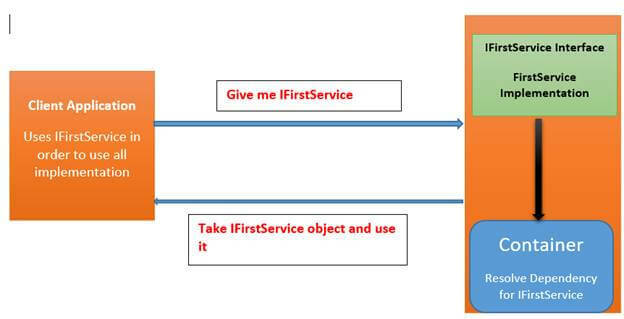 Kindly copy and paste the following url to ensure the IFirstService availability at action level.